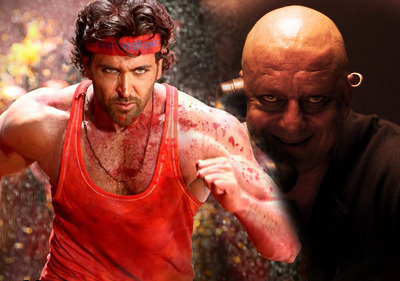 Opinion Poll: What is the most impressive aspect of "Agneepath" remake? When you remake any film, whether it is a tribute or not, there will be always be comparisons. Mukul Anand’s original Agneepath may have not hit big jackpot in Box Office but it had the greatest actor in Indian cinema history, the award-winning Amitabh Bachchan. When you came out of the theatre, you just remembered Vijay Dinanath Chauhan. After Deewar, I would rate it as Amitabh’s most memorable performance as an Angry Man. With Agneepath Remake, one thing is confirmed -there is only one Amitabh Bachchan. Whilst Hrithik Roshan gives a brilliant performance and is very intense, there is something missing in the Remake. The baritone voice and dialogue delivery style of Mr Bachchan put the original Agneepath on a different level altogether. Hrithik has great physique and personality but the villain Kancha Cheena’s (Sanjay Dutt) personality overshadows him in the film. Even the climax belongs more to Sanjay Dutt (Villain) then Hrithik Roshan (Hero). The director Karan Malhotra had big actors in his helm and big production house like Dharma Productions supporting it. The movie has been made in big canvas but the story could have been made more dramatic. The screenplay could have been tighter. This movie could have been better with fewer songs as these make the movie longer and there are few points where the movie drags. The romantic angle between Hrithik and Priyanka is the weak sub plot in the film. Do we really need glamour doll heroines in an action film like Agneepath? The mother and son relationship between Zarina Wahab and Hrithik Roshan could have had more scenes to carry the intensity of the film. Hrithik should have had some big action sequences in the first half of the film as the audience has got used to action films like Wanted, Dabangg and Singham. We like our Hero to have more Attitude than Intensity. At the end of the film, I only remember memorable dialogues of Sanjay Dutt and even Rishi Kapoor. Sadly Hrithik has not been given dhamakedar dialogues. In Hindi action films, this is very much expected from the main Hero. The movie however belongs to the villains. Both Sanjay Dutt & Rishi Kapoor have given menacingly high quality performances. Rishi Kapoor as Rauf Lala is the surprise package of the film. We have seen him in romantic films and comedies over the years. Why was this bad man hiding in this brilliant actor for so long? He should surely do more roles like this. Sanjay Dutt as Kancha Cheena is the biggest attraction for Agneepath. You remove him from the film, the film falls flat. In very few films, villains completely overshadows the main protagonist of the film. After the film, people will talk more about Kancha Cheena and Rauf Lala rather than Vijay Dinanath Chauhan. Priyanka Chopra looks good and also acts well but her character is not good for the film. We are tired of seeing Om Puri in similar kind of roles these days. Zarina Wahab couldn’t match the performance of Rohini Hattagandhy in the original film. Katrina Kaif is another plus point of the film. She got the maximum whistles in the theatre. The music is good for an action film. “Chikni Chameli” is the highlight song of the film. The original Agneepath belongs to Khalnayaks of the film and we should stop remaking Amitabh Bachchan films. When he has essayed a character, why do we need see any other actor portraying the same role? It can’t ever be bettered! So my recommendation is to go back to our old DVD Collections and watch the original film rather than the remake.